The appointment of a new CEO is never a trivial event but it takes a particular dimension at Panerai. Indeed, Angelo Bonati was replaced by Jean-Marc Pontroué a few months ago after 18 years at the head of the brand. A position with such duration necessarily leaves traces and the challenge for Jean-Marc Pontroué is to give a new dynamic, to change certain habits, to adapt Panerai to the realities of the current market while building on the strengths of the brand and its production tool. 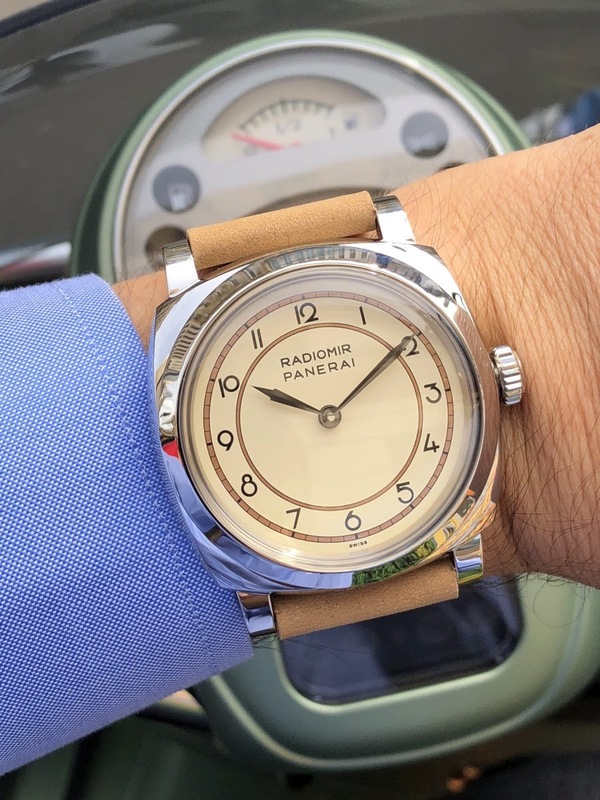 The roadmap is clear: Panerai must regain growth momentum and finds again its place in the hearts of the fans it used to have during the first part of the Angelo Bonati's period. The task is complex but the essential thing remains: the Panerai style is always recognizable at first glance and it is an immeasurable chance in a difficult market to have strong aesthetic characteristics that create emotions. 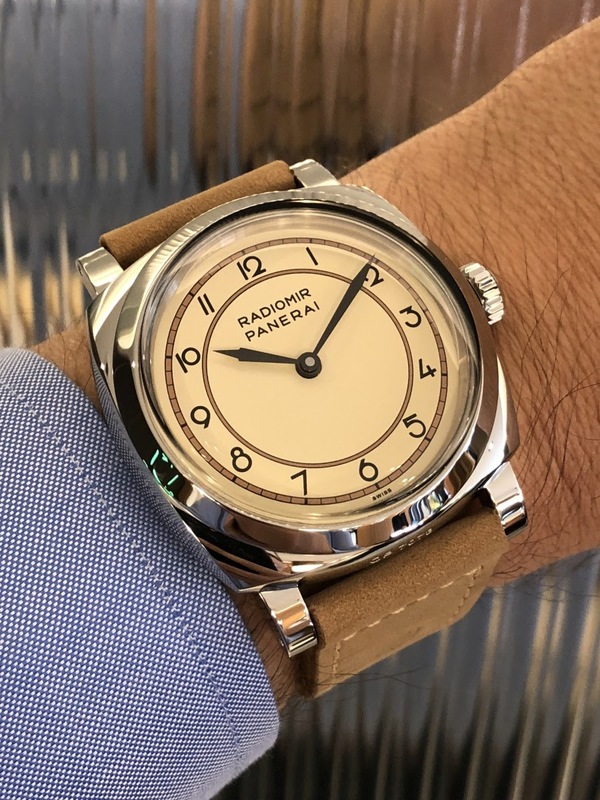 Changing without turning the back on the past, it is also the same story with the Radiomir 1940 3 days Acciaio PAM790 (black dial) and PAM791 (ivory dial). These two watches, which are becoming available in the boutiques this autumn brings a wind of novelty in the Panerai style without losing the fundamental elements of the manufacture. In fact, everything starts from the dial. The two dials are not this time inspired by a watch from the past (a usual practice of the brand) but by a pendulum clock that customers of the historic shop in Firenze came to admire a long time ago. I find the idea of ​​changing the source of inspiration excellent. By dint of practicing the same recipes, Panerai ran the risk of going definitively in circles. These two watches are for me much more than novelties unveiled in September as there are each and every year. In a sense, they foreshadow Panerai's desire to explore other worlds to reinvent itself. It's not about getting over excited. I'm not explaining that these watches have nothing to do with what Panerai practices: even hiding the words on the dials, we recognize their provenance without hesitation. 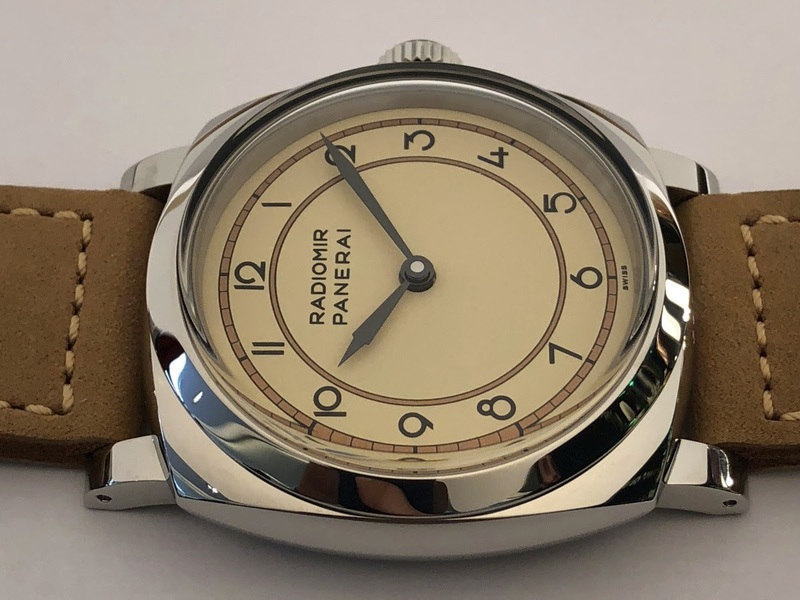 And this is the key of this successful approach: these two Radiomir are both original, surprising but at the same time marked by the Panerai seal. The dials are simple, rigorous and very seductive. They have peripheral and inner chapter rings that bring a touch of refined color. They delimit the area in which the Arabic numerals are drawn with an art-deco style font. 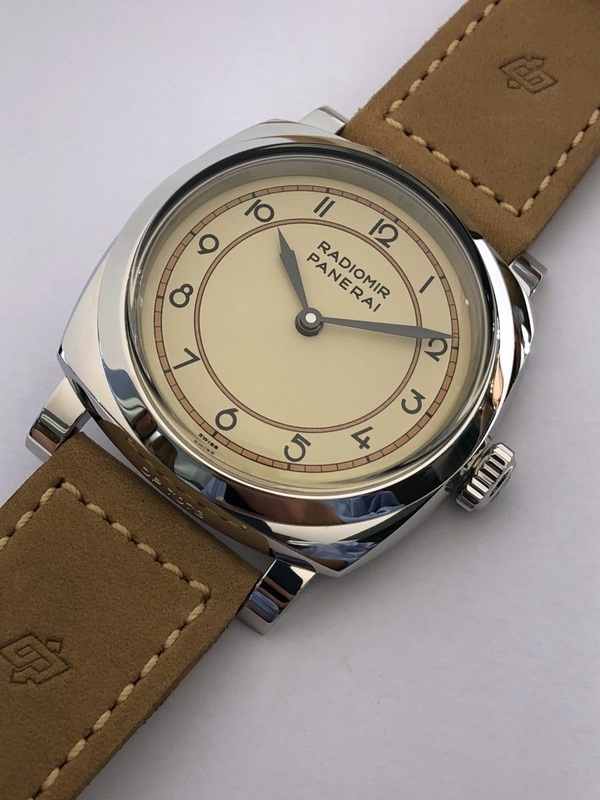 The only inscriptions (in addition to the tiny "swiss" at the bottom of the dials) are the two words "Radiomir" and "Panerai" whose size could be felt as too large but are perfectly at ease in the context of a very pure design. And then that's all. Because these two Radiomir are two-hand watches and that's fine as well. Panerai has simply gone to the basics and this sober style brings a lot of elegance and distinction. 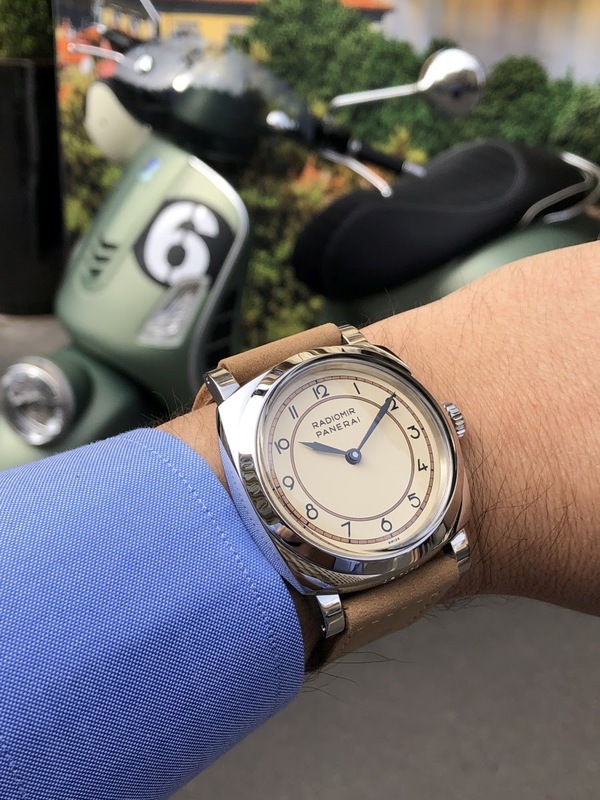 The result could have been perceived as too austere if it had not been enhanced by a magnificent pair of tapered hands whose shape is a big premiere for Panerai. I'm really in love with these hands that display time with a lot of class. Moreover, it is better that they are successful and attractive because they really play the first role on an "inert" dial. After examining the two watches, I have no hesitation: it is the ivory dial that I prefer and it is a very clear choice. First of all, it is obviously brighter and it offers a larger range of shades. Then I find that it better highlights the hands. Finally, the legibility of the watch remains optimal and the reflections on the glass have less impact. The counterpart is that the ivory dial watch has a larger perceived size than the black dial one. It is a reminder that the diameter of the steel case is 47mm which is impressive. But here it is: there is a know-how at Panerai that makes the cases of such a size much more subtle than they seem to be at first glance. This is due to the way they are built on several levels, the round bezel placed on a cushion base, with short lugs, the shape of the crown. 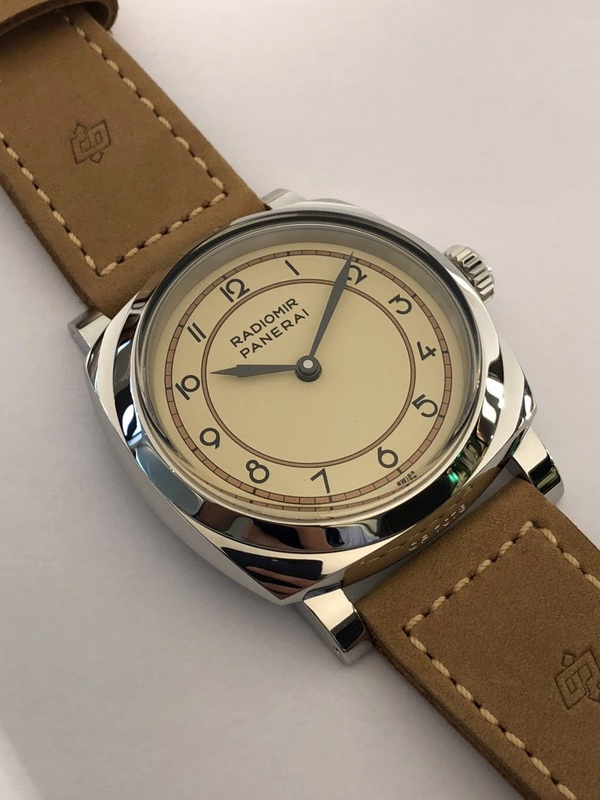 Yet, looking at the case side of these two Radiomir 1940, I was surprised by their thickness, even for watches with a water resistance of 100 meters. I don't have the exact measure of the case thickness but it doesn't seem to be far from the 20mm. There is something to tempt the most enthusiastic fans of these models but this thickness is explained by a very good reason: the shape of the plexi glass. This glass also contributes to the aesthetic success of the whole by adding a retro and charming touch. Only a handwind movement is consistent with such a dial design. 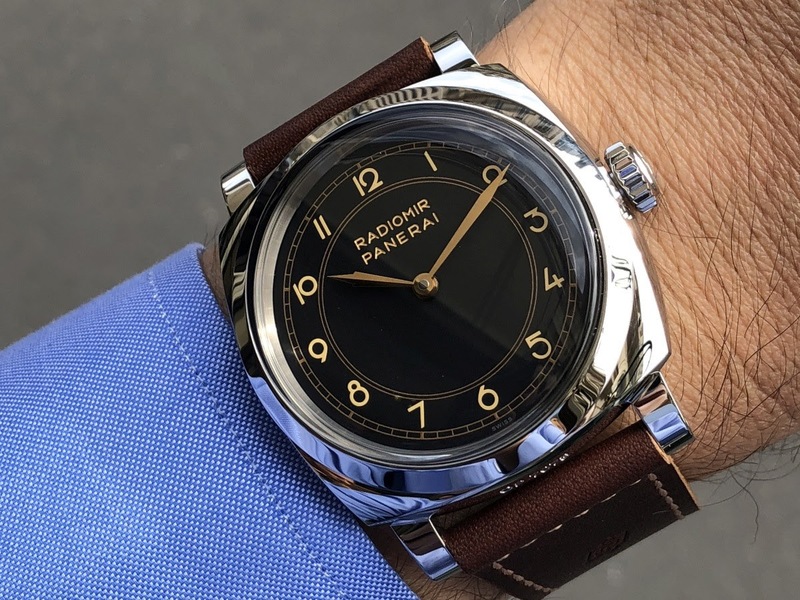 That's why Panerai made the right choice to use the in-house caliber P3000 with a frequency of 3hz for a generous 3-day power reserve thanks to the double-barrel. The movement is visible through the transparent caseback. The positive side is that its large size makes it suitable even for a 47mm case. On the other hand, its contemporary (shape of the balance bridge) and rather austere presentation (a very large bridge that covers more than half of the caliber) seems a little off from the atmosphere of both watches. 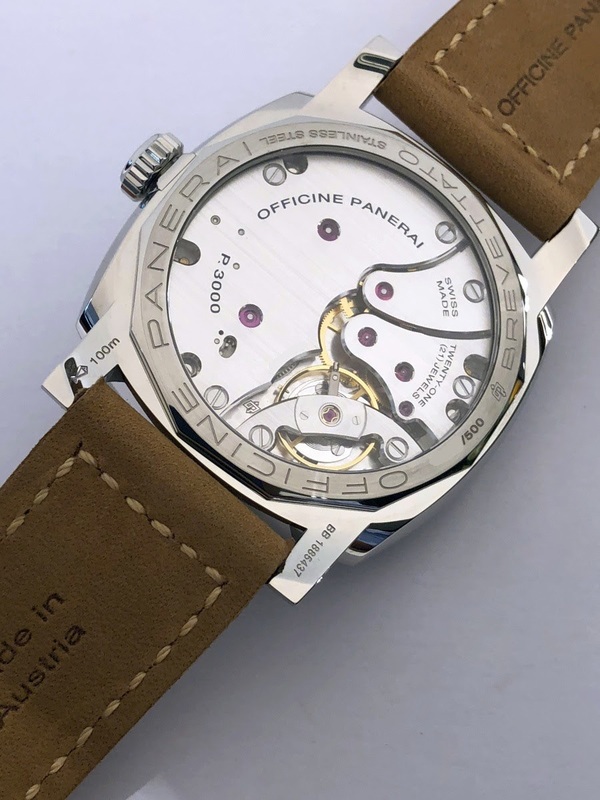 Even if its finish is neat, I would have rather made the choice of a solid caseback which in addition would have had the merit of slightly reduce the thickness. However, I know that many customers prefer a visible movement and even more often when it is a handwind movement. What pleased me the most with the PAM790 and PAM791 is the controlled contrast between the imposing size and the elegance of the dial. This opposition creates a special atmosphere that gives a lot of charm to these two watches. And yet, they are bulky timepieces! But the cases are well positioned on the wrists and the handling of the crown is easy. It can be screwed and unscrewed very easily what is a crucial point for a handwind watch. In addition the daily winding operation is not mandatory but I recommend it ... because otherwise the risk of forgetting to wind the watch at the end of the power reserve is real! Even if Jean-Marc Pontroué was not intrumental in the release of these two Radiomir, he must however find food for thought. In the context of the revitalization of the brand, such an aesthetic approach offers alternative perspectives. It will be interesting to see if other Panerai watches will benefit from a similar inspiration in the future. The PAM790 and PAM791 are available at a price of 8,900 euros including tax in France in limited series of 500 pieces each. Thanks to the team of the Panerai boutique of Paris - rue de la Paix. Thanks a lot for your words! This watch may be perfect on the Due case. I don't know. It is a good remark but we also need to take into consideration the glass shape. I very much agree! The case size is the biggest issue for me, just doesn't make sense. The dial has real potential otherwise, shame. Disclaimer: This article does not intend to promote or to undermine any aspects of the watch, and is purely a study of the movement out of interest by a non-professional hobbyist. Credit where its due that FP Journe made a new split-second watch for Only Watch 2017, and (unlikely) might see the possibility that this may appear as a regular production piece! With the recent announcement of Only Watch 2017, it comes as no surprise to expect a feast of interesting timepieces up for viewing. Typically, most brands ... .